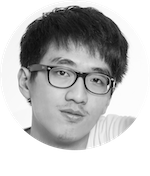 Originally from Tainan, Taiwan, I moved up to Taipei to go to National Taiwan University and to pursue a career in engineering and art. I have dabbled into many engineering professions including construction, mechanical, and computer science. Based on the fundamental engineering knowledge, I developed my taste in visual arts and devoted myself into the creation of it. Thus, I started my career of photography, film production, and computer graphic. 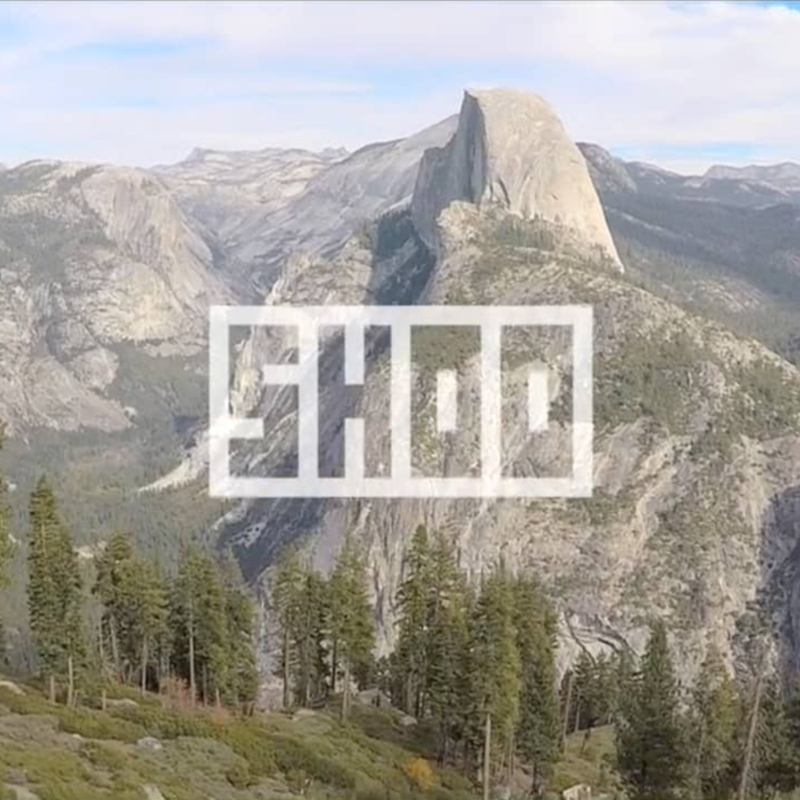 Furthermore, I founded SHOO™, an advanced UVS (unmanned vehicle system) solution provider, and Toomba Films, a film production house, which are now providing services for government and enterprises in Taiwan. In short, I would say that I am an engineering knowledge-based artist who gravitates towards the intersection of technology and liberal arts. - M.S., Department of Civil Engineering, National Taiwan University, Taiwan, 2013-2015. - B.S., Department of Civil Engineering, National Taiwan University, Taiwan, 2009-2013. 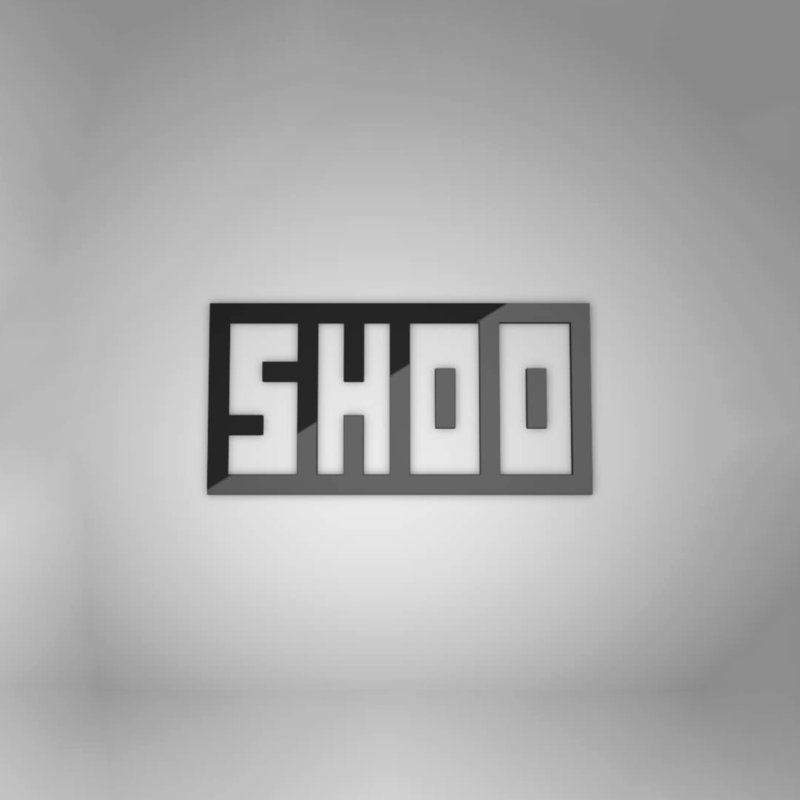 - Senior Technician, SHOO™ Advanced UVS Solutions, 2014-Present. 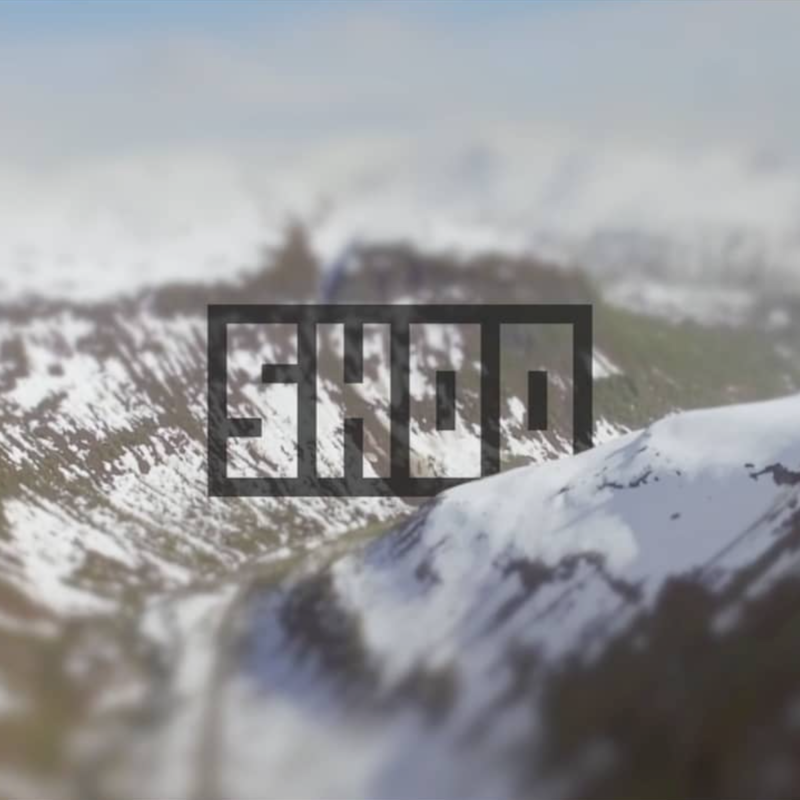 - Director of Photography, Toomba Films, 2015-Present. - Freelance Commercial Cinematographer, 2012-2014. 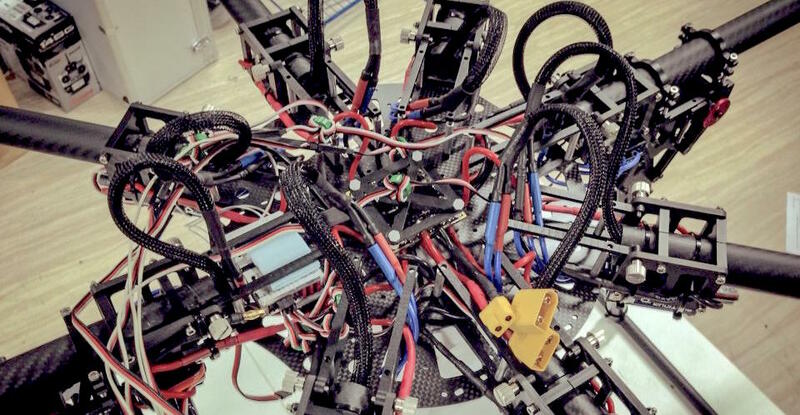 - Research Assistant, R-Lab (Robotics), National Taiwan University, Taiwan, 2014-2016. - Course Instructor, T-Workshop Innovation Design, Center of Innovation and Synergy for Intelligent Home and Living Technology, Taiwan, 2013. 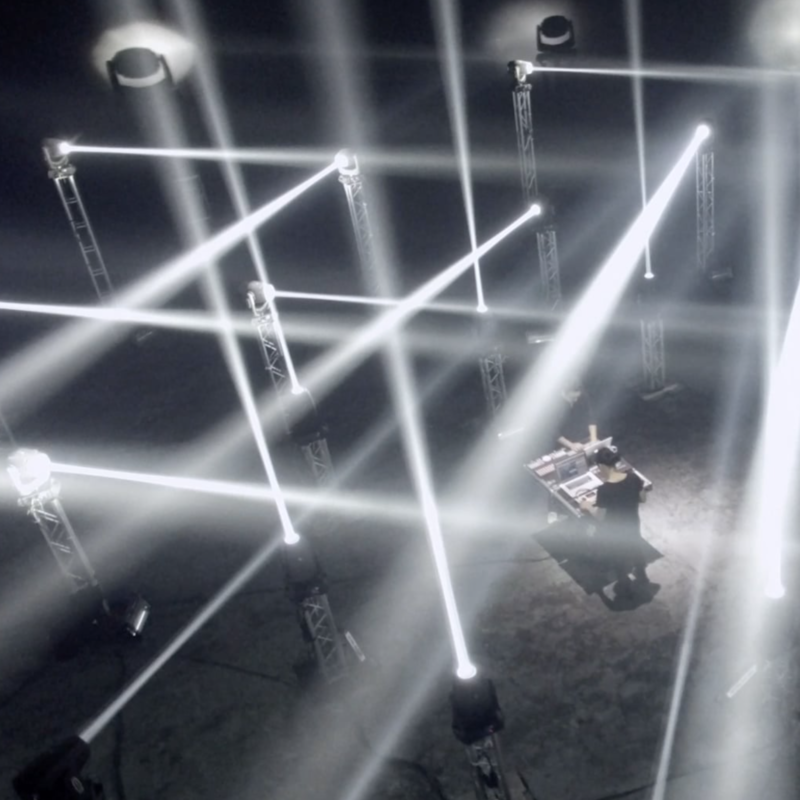 - Research Assistant, V-Lab (Visualization), National Taiwan University, Taiwan, 2012-2014. - Teaching Assistant, Automation and Robotics, National Taiwan University, Taiwan, 2012-2014. - Research Intern, Ministry of Science and Technology, Taiwan, 2014. - Research Intern, National Applied Research Laboratories (NARLabs), Taiwan, 2013. - Teaching Assistant, Student Service Education (Ⅲ), National Taiwan University, 2012. - Hardware Technician, iRepair Co., 2010-2012. Teleyes: To see is to believe. 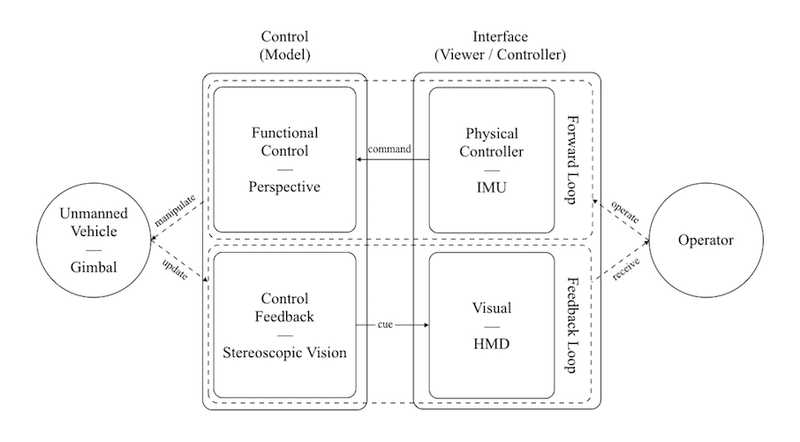 Keywords: Stereoscopic Vision, Image Processing, Robotics, Motion Tracking, NUI, Human-centered Interaction. Teleyes is a telepresence system to reduce visual distortions of remote environment for remote operator. Visual distortions includes problems of depth perception, direction control, and realtime transmission. 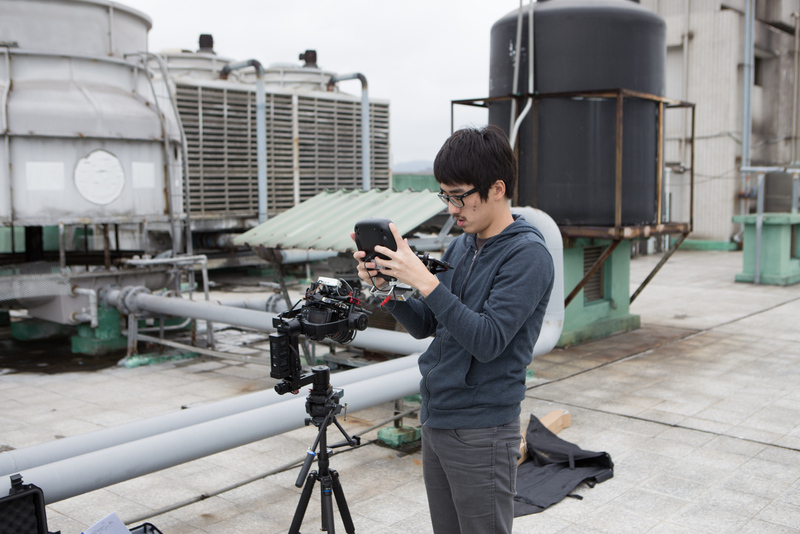 Teleyes utilized stereoscopic image processing, encoding, transmission, head mount display, and motion tracking methods to achieve a avatar-like vision system for remote monitoring and teleoperation. Comparison of Existing Method(left) and Teleyes(right). Most of teleoperation applications take place in remote environments that are unstructured and not precisely known a priori. Therefore, fully autonomous control of an unmanned system is infeasible in such cases. To impose human intelligence on the task to cope with uncertainties, an improved telepresence system that eliminates the gap between machine and operator is essential. Current methods mainly use two-dimensional (2D) image covering a restricted field-of-view (FOV) as visual aid and numeric onboard sensor readings as references for operators. Since, sensory cues are significantly lost which include ambient visual information, depth information, and kinesthetic input. Also, in cases that use unmanned vehicle system (UVS) to inspect fully unknown areas, sensor information is not applicable until it is analyzed or processed. 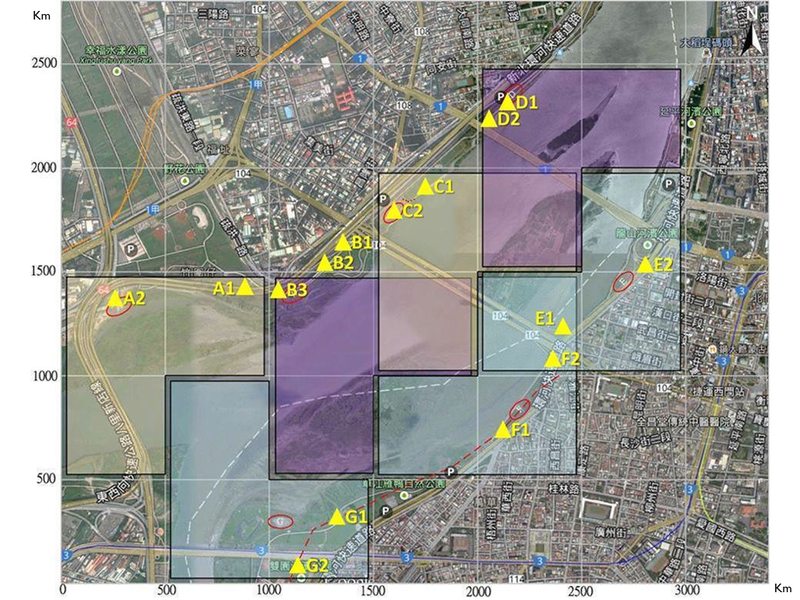 Instead of sending multiple sensors into the field with unmanned vehicles and retrieve a large amount of data for time-consuming post analysis, an instinct and sensory method for quick understanding and reconstruction of onsite situation is needed. The major effort of this research is taking advantage of state-of-art technologies of three-dimensional (3D) input/output and developing an avatar-like mechanism to synchronize the physical behavior of an operator. Two of 3D input/output methods are used in this research: stereoscopic vision and motion tracking. 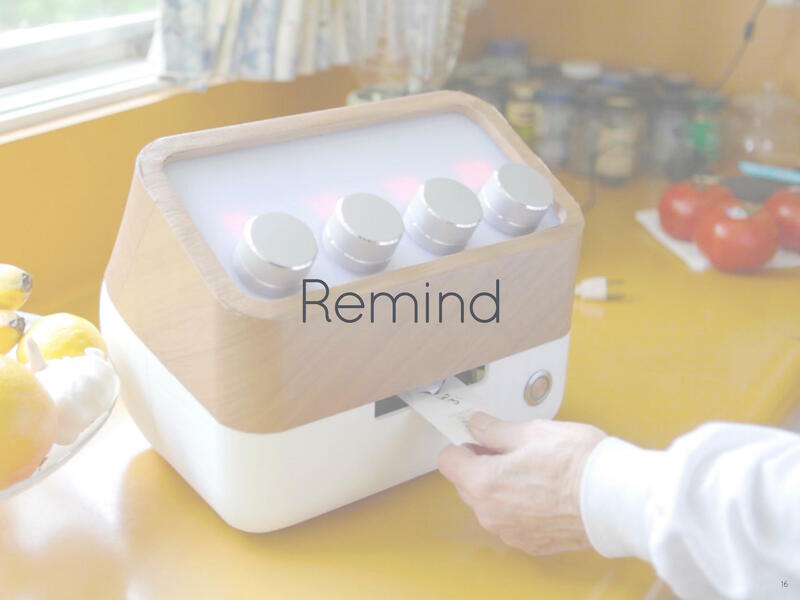 The system is designed to work under a close-loop control with human feedback involved. 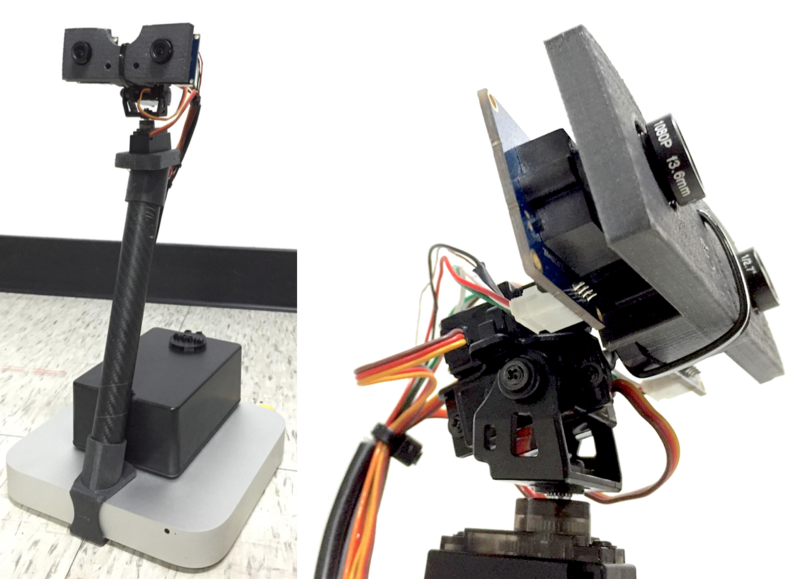 Two cameras that are optimized according to human eyes angle-of-view (AOV) for accommodating human eyes’ perspective are used as stereoscopic vision input on the unmanned vehicle. 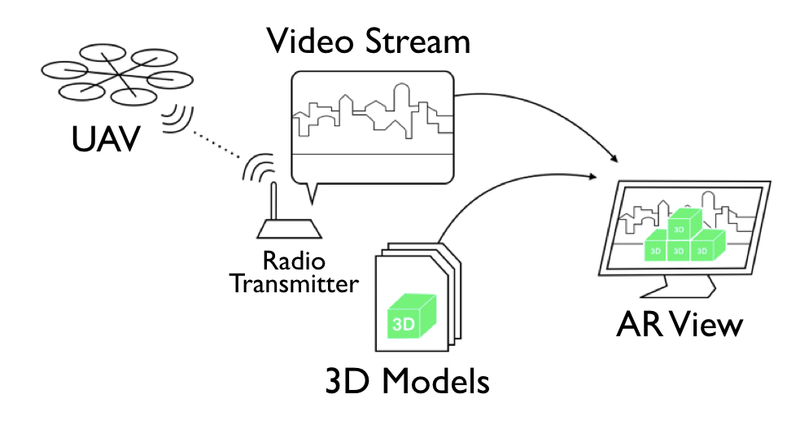 The stereoscopic image is then streamed back to the operator through radio downlink in realtime. 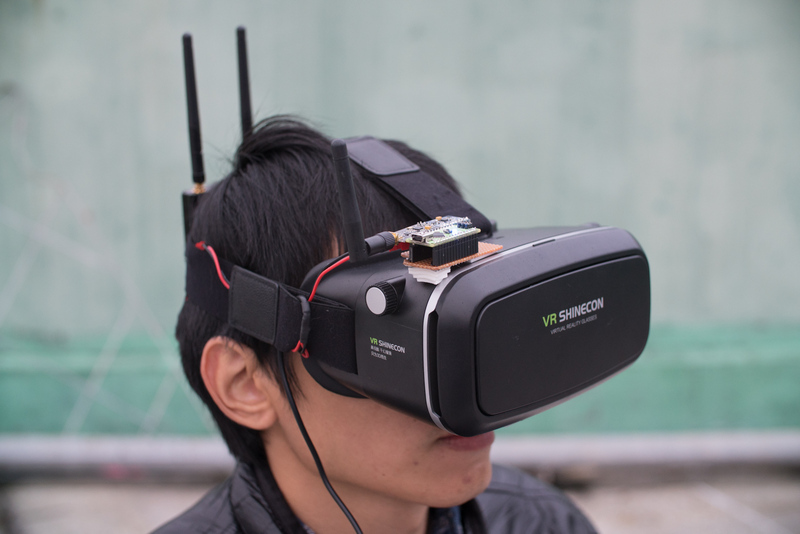 On the operator end, a head mount display (HMD) is used for displaying the stereoscopic image and tracking head movement of the operator with embedded sensors. 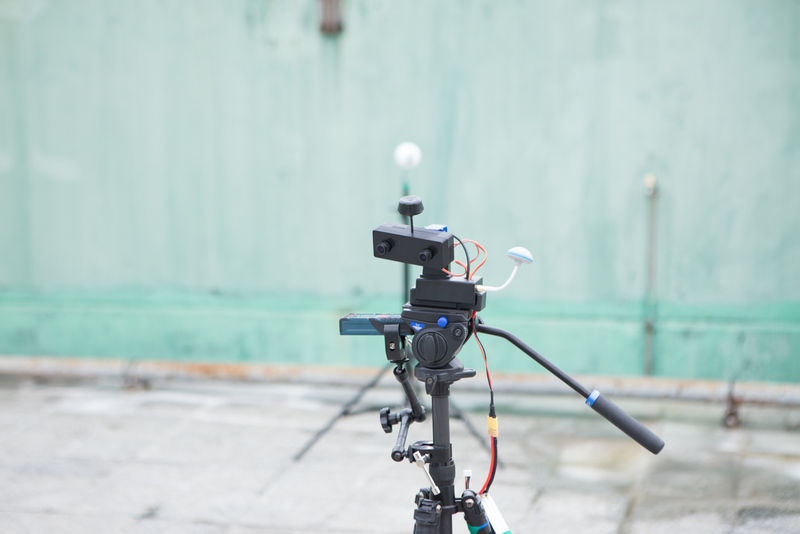 The head tracking data are interpreted to control signal and returned to unmanned vehicle for controlling a three-axis gimbal mechanism on which the two cameras are installed. Then the loop is closed by synchronizing the operator and cameras’ FOV. Teleyes system has been validated on a designed experimental application scenario comparing with existing methods with five operators. The result shows that Teleyes significantly reduces distance error of four test operators by 66.84%, 47.75%, 33.41%, and 40.58%. 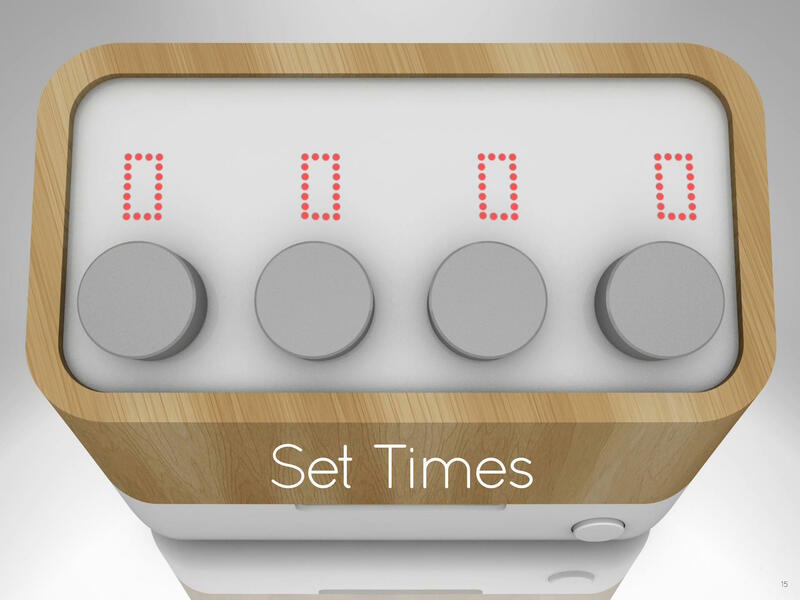 It also significantly reduces time usage of four test operators by 19.24%, 23.86%, 22.63%, and 0.93%. In conclusion, the Teleyes system has improved visual experience and operating efficiency that have potential on saving general resources and expanding the application. The developed system provides operator an immersive first-person view (FPV) that provides the operator a visual experience as being onboard. Teleyes' preliminary works were published and presented on 2015 ISARC (International Symposium on Automation and Robotics in Construction and Mining) under the topic of ptimized Unmanned Vehicle System for Disaster Inspection. The full Teleyes research was published as my master thesis. Below is the presentation video (in Chinese) going through the entire research context. - M. C. Wen, C. H. Yang, Y. C. Chen, E. X. Sung and S. C. Kang (2015, Jun). 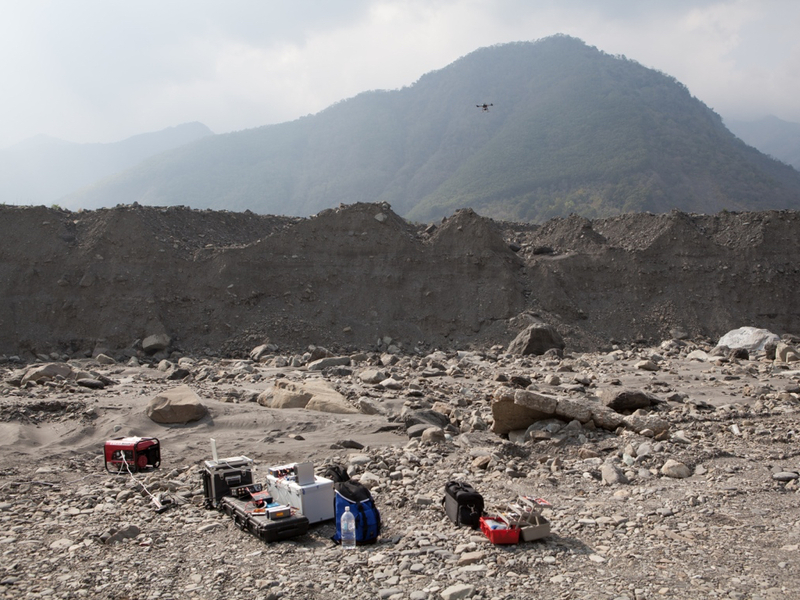 Optimized Unmanned Vehicle System for Disaster Inspection. Proceedings of 2015 International Symposium on Automation and Robotics in Construction and Mining (ISARC), Oulu, Finland. The master thesis by Ming-Chang Ray Wen at National Taiwan University in 2016. Advisor: Shih-Chung Jessy Kang Ph.D., S.E. 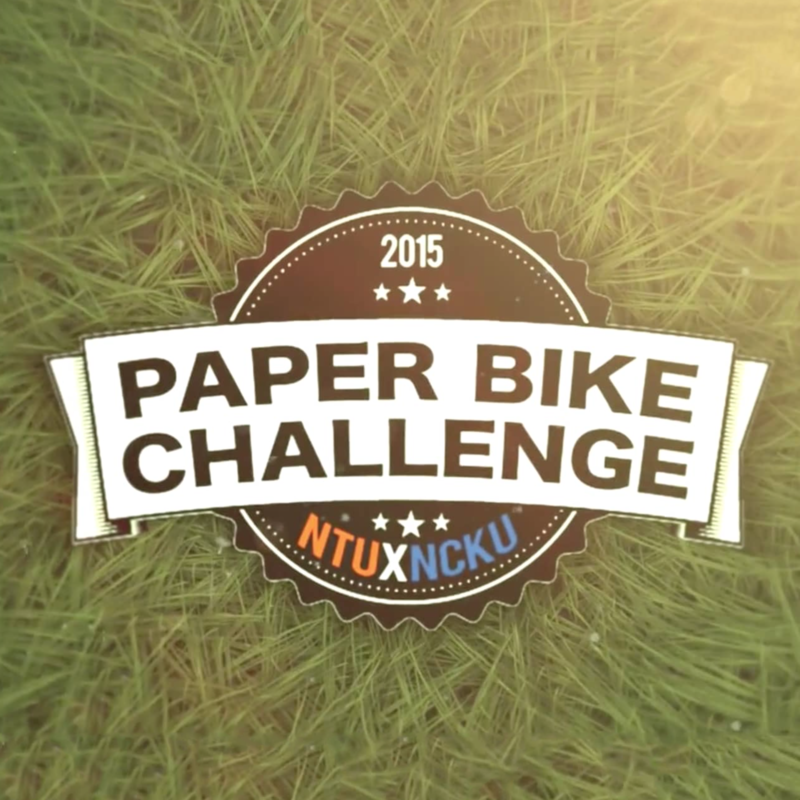 Sponsored by SHOO - Avanced UAV Solutions and Optoma Corporation. 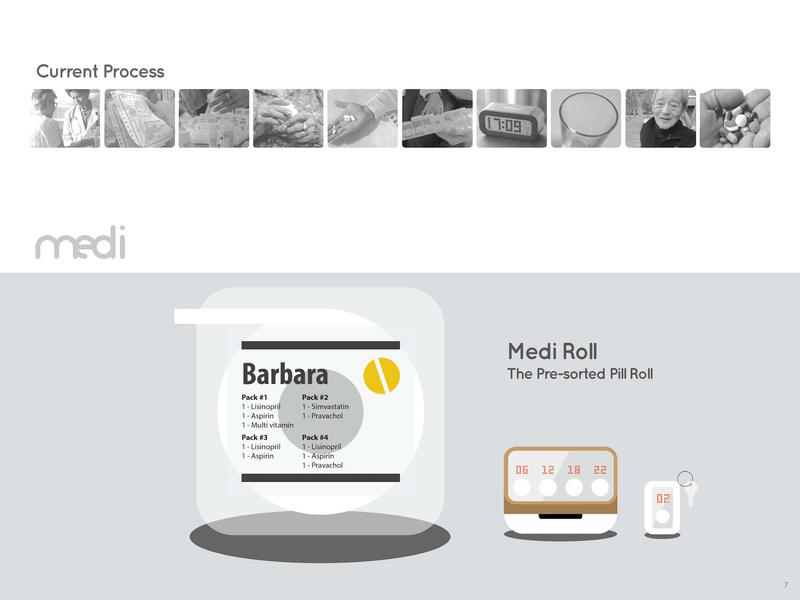 Medi: The full service pharmacy. 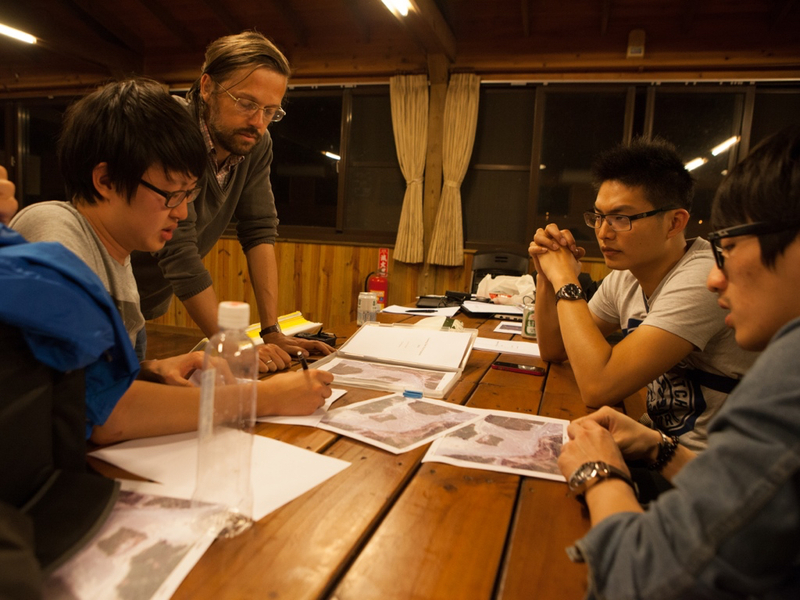 Keywords: Design Thinking, Human-centered Interaction, Prototyping, Service Design, Robotics. 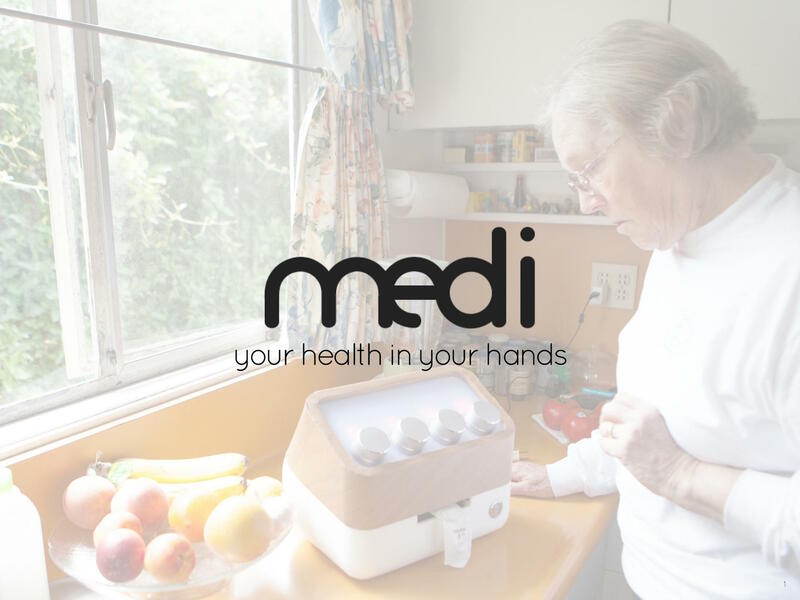 Medi is a systematic solution to ameliorate the medication problems for elderly patients that has long existed. 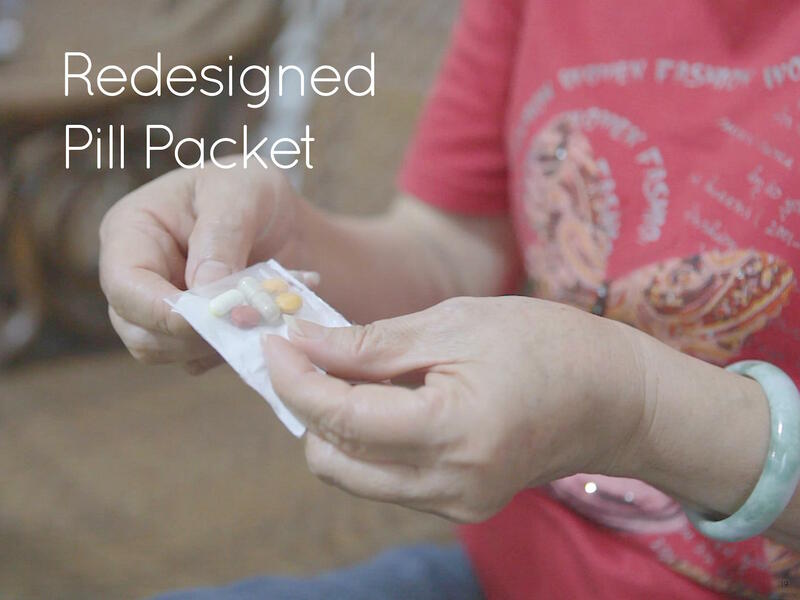 We are imaging a world where elders can enjoy daily life without massing with medication instructions and sorting pills. Medication compliance is especially profound in the elderly population who are the population most likely to have multiple chronic illnesses. After having researches on our target groups, most of these problems can be related to two major issues: complicated instructions and a lack of awareness on scheduling. 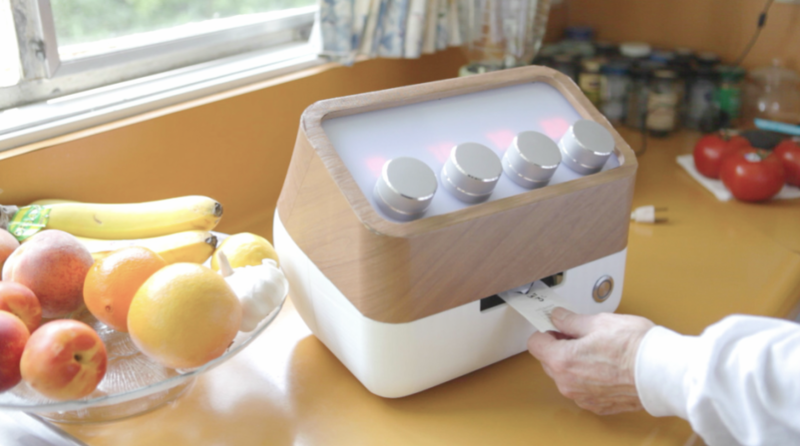 Medi connects elder patients and physical pharmacies closer by utilizing numerous home automation methods to their medication routines. 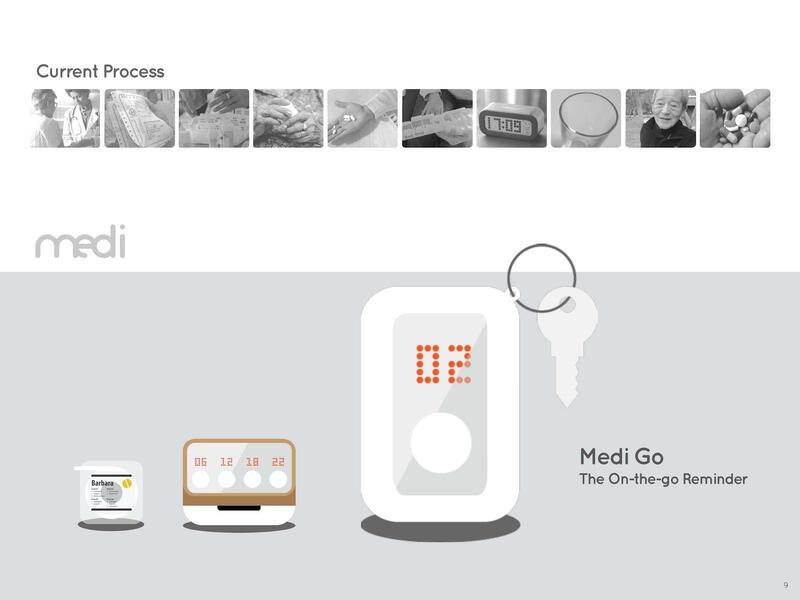 Medi is a cloud medication management service with a physical home unit for each patient. As the patient got a prescription from the doctor, the hospital sent it to the Medi Cloud, a virtual pharmacy ran by physical pharmacies. 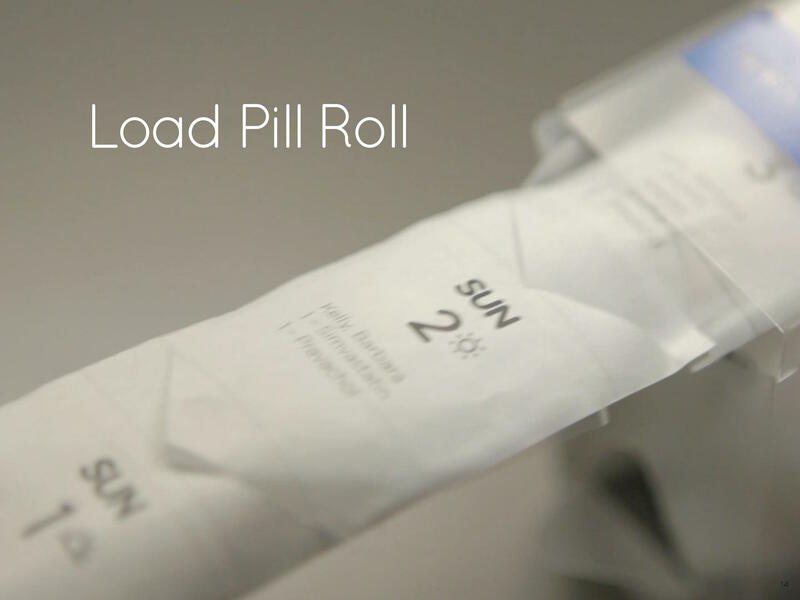 In the meanwhile, the patient went home and wait for the delivery of Medi Roll, the redesigned pre-sorted and easy-to-tear pill packets, would be delivered within a day. 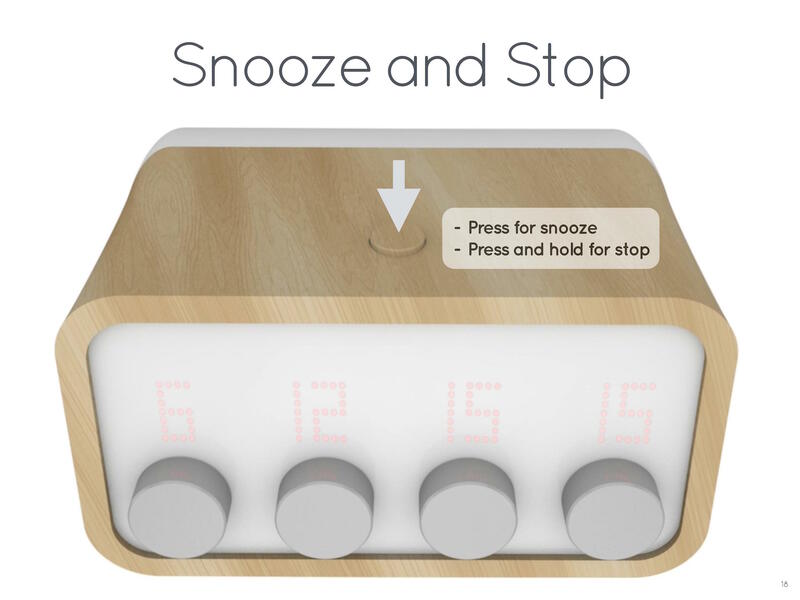 The patient refilled the Medi Home unit with the new arrived Medi Roll, set the time of his/hers four daily routine times: breakfast, lunch, dinner, sleep times, and Medi Home would took care from here. 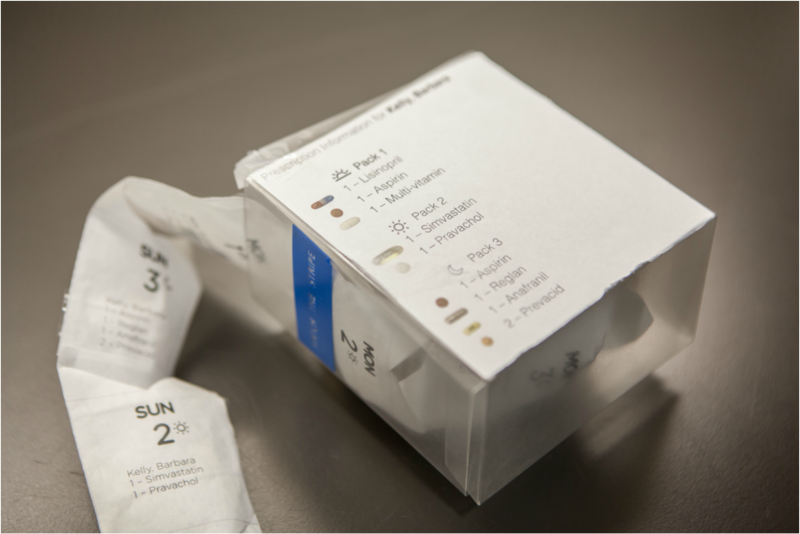 The patients would be notified of taking medication and given the exact pill packet automatically, whether the instruction of prescription requires patient to take right after lunch, every four hour, or before sleep. 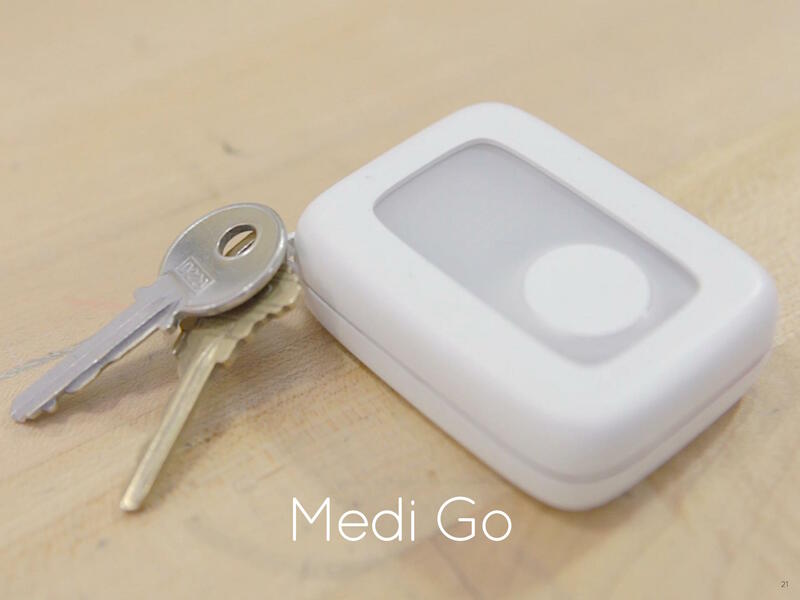 When the patient went outdoors, Medi Go, a synced portable keychain, would notify the patient like Medi Home did. 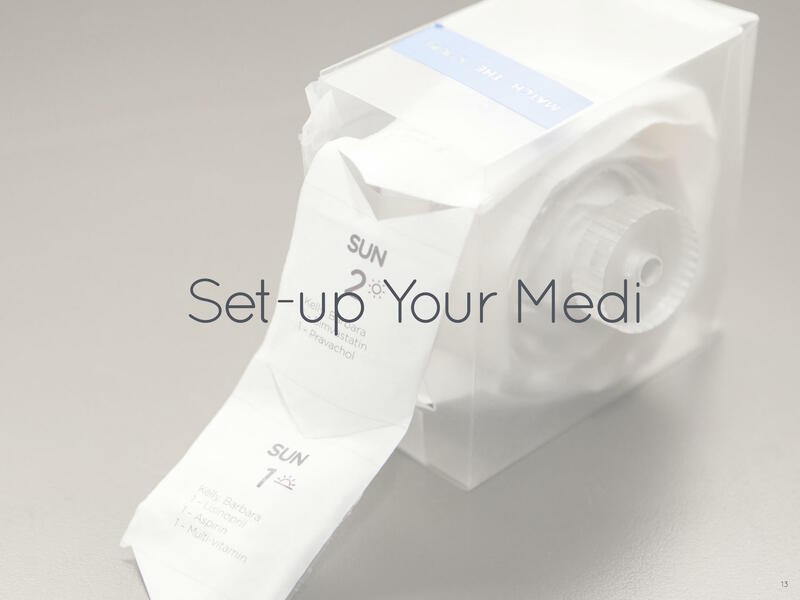 Medi Roll already had all prescribed medication schedule programmed inside and every packet is sorted according to the schedule. 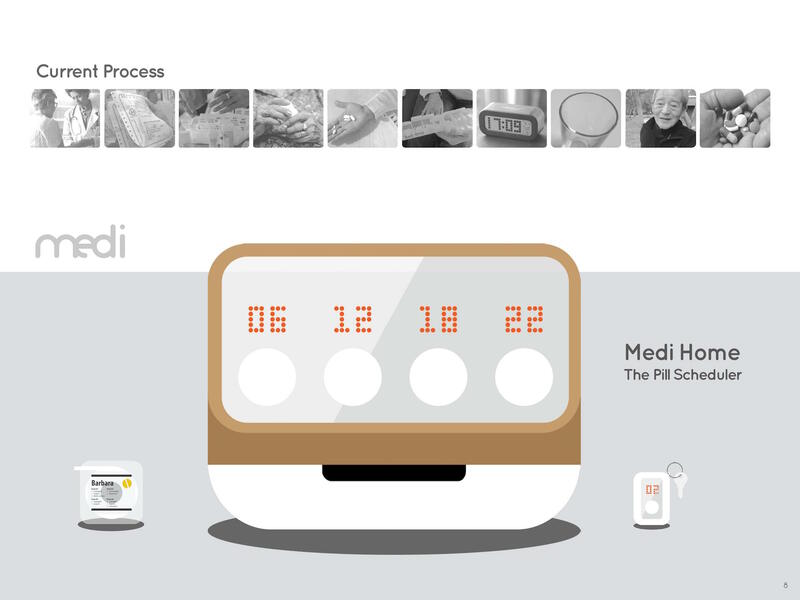 Medi Home “customized” the schedule through preprogrammed mechanism to fit the life schedule of the individual patient. 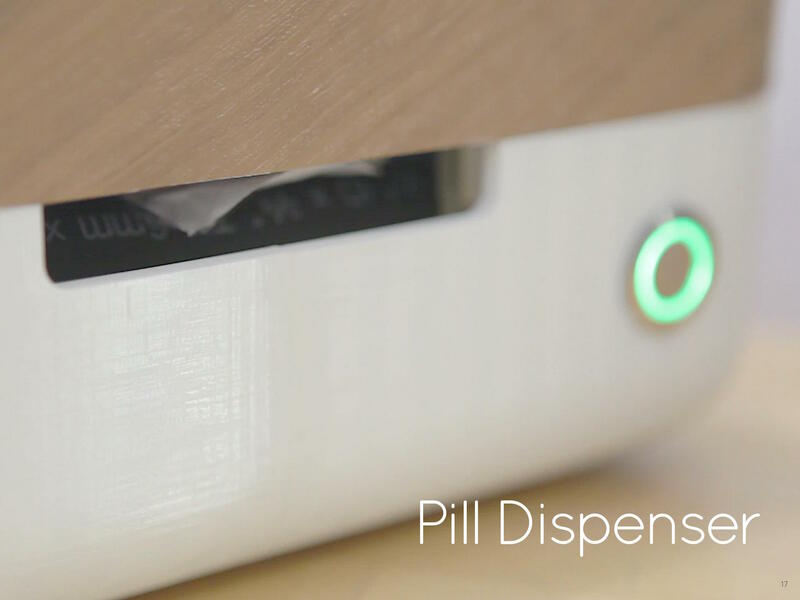 Once the pill packets rans out, Medi Home connected to Medi Cloud to request for further medication instruction, whether asking for same prescription delivery or notifying patient for returning to the doctor. 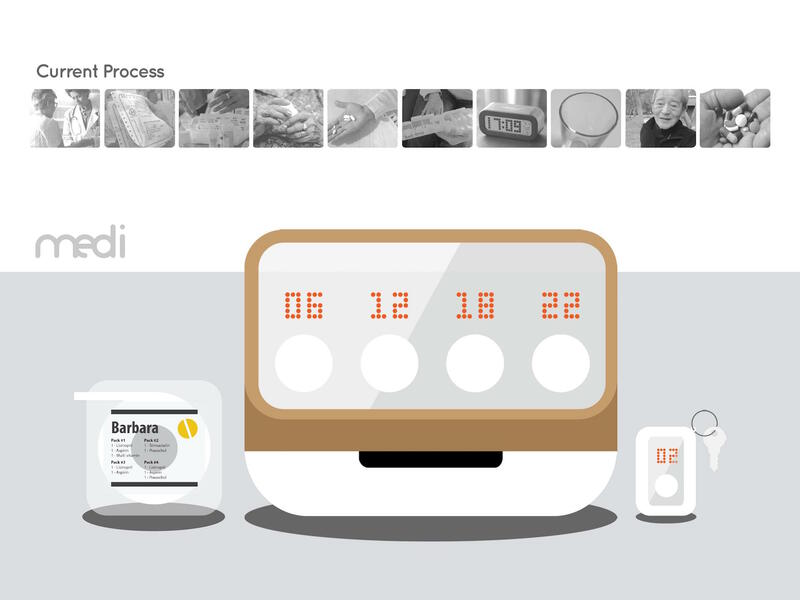 Medi solved the two major problem of elder’s medication as we addressed in advance: complicated instructions and a lack of awareness on scheduling. 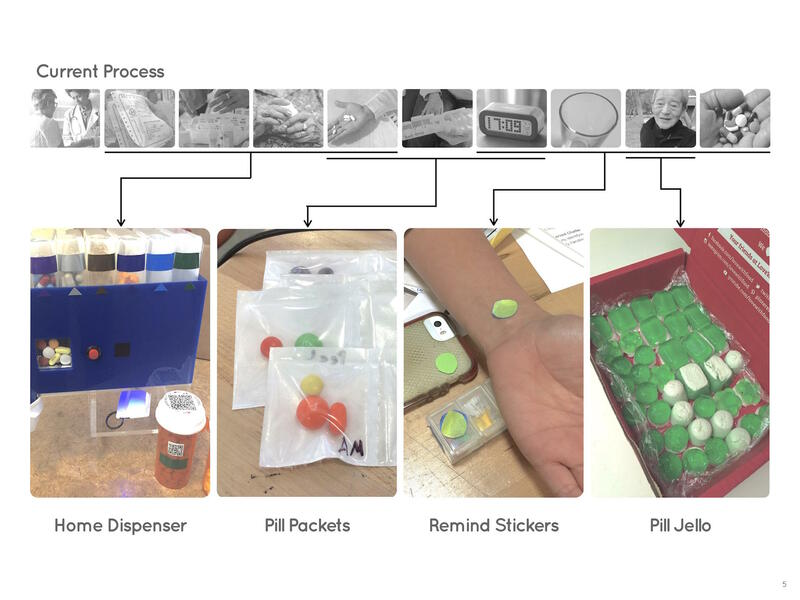 Also, many minor problems were solved such as difficulties on sorting, preserving, carrying pills, and more medication tracking and data analysis. 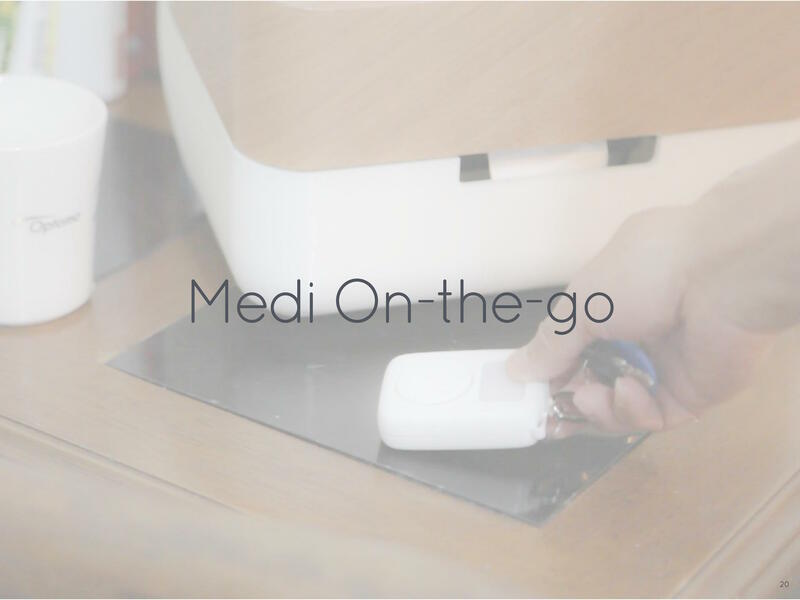 Medi makes all the ways you’re used to taking medication more simple, convenient, and reliable. It is a whole new life experience to be released from annoying pilling routines. One that’s simpler than ever. 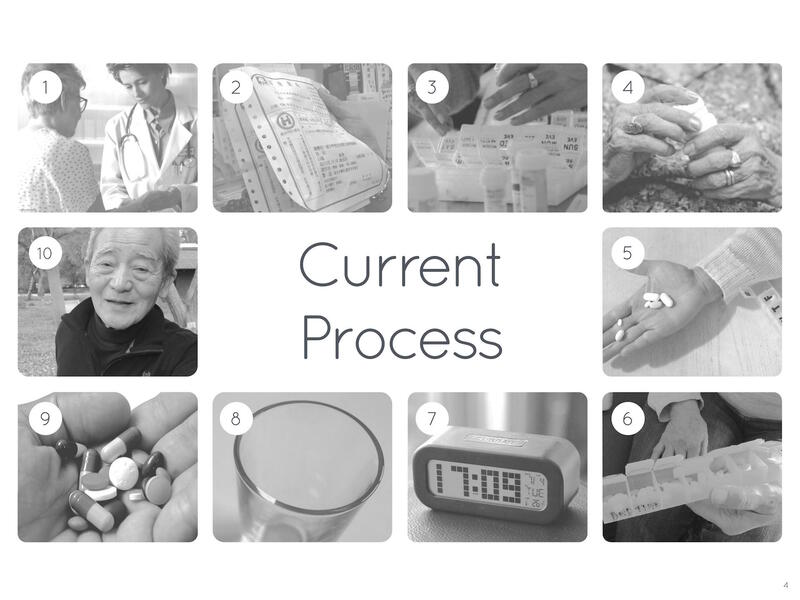 We believe that care providers are desperately needed in these processes to confirm that patients are getting their medications on time and in the correct doses. 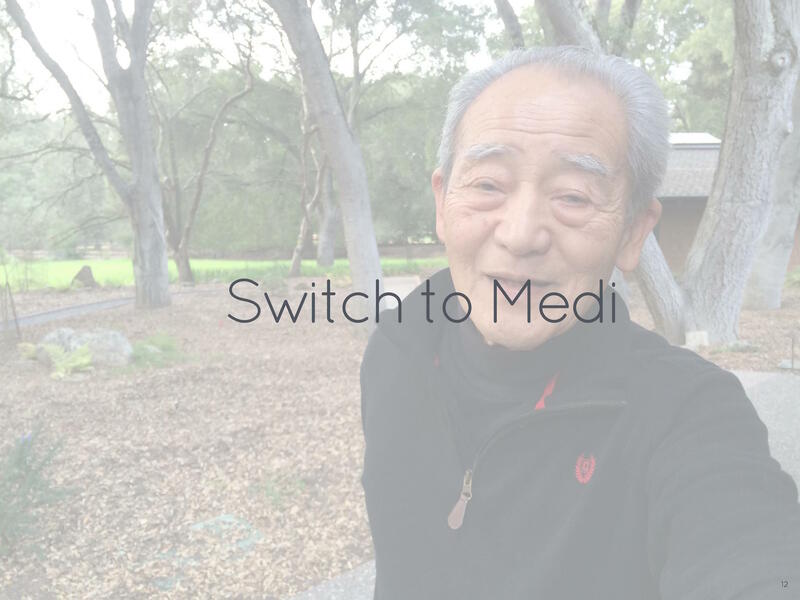 Medi was presented on 2015 ME310 X Sugar EXPE at Stanford University, a annual innovation development event including more than 20 international companies and VCs. Medi was nominated for best presentation. The full presentation can be seen HERE (video is owned by Stanford University). 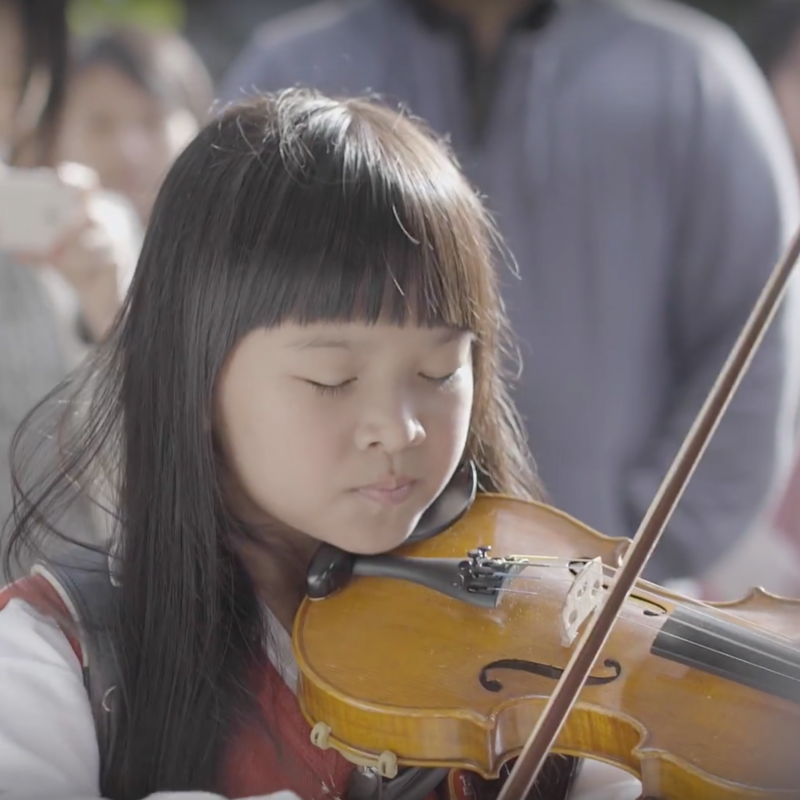 A global collaboration project by National Taiwan University and Stanford University. 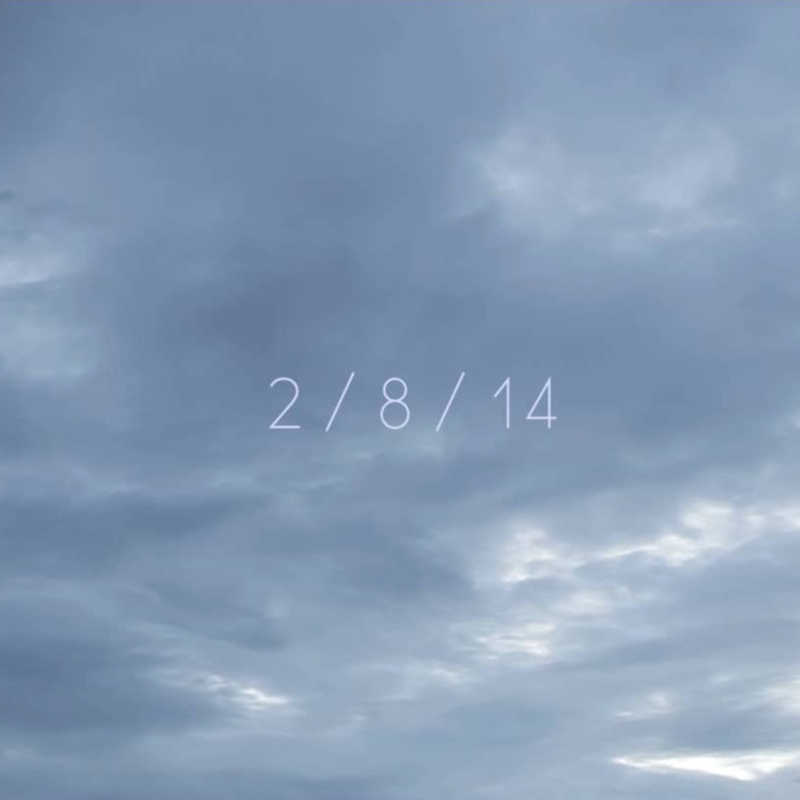 In collaboration with Yu-Cing Liou, Ci-Jyun Polar Liang, Morgan Liu, Jason Yang, Steph Lim, Joel Torres, Sarah Gonzaga. 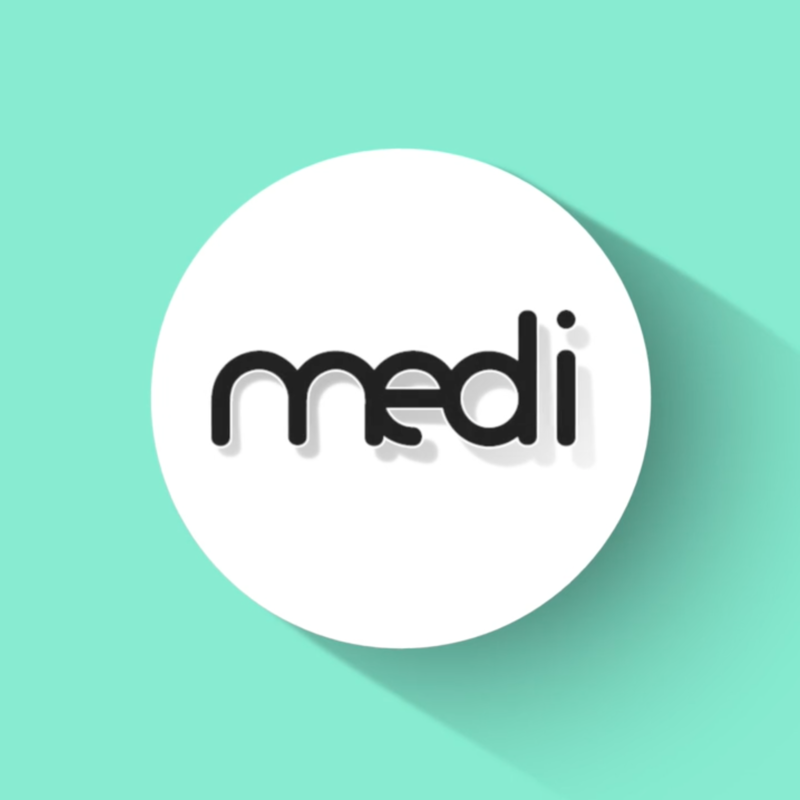 Website: Medi: The full service pharmacy. Keywords: Augmented Reality, UAV, Teleoperation, Automation, Robotics. 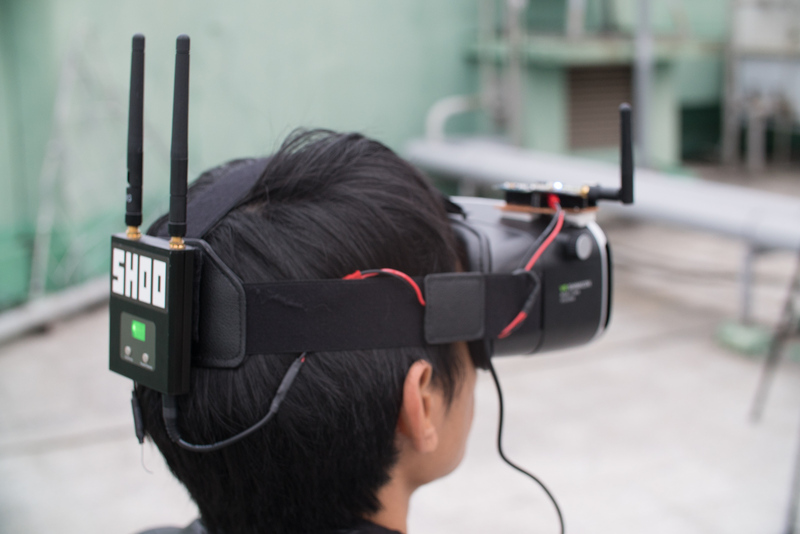 UAVAR is a construction-scale augmented reality (AR) interface. 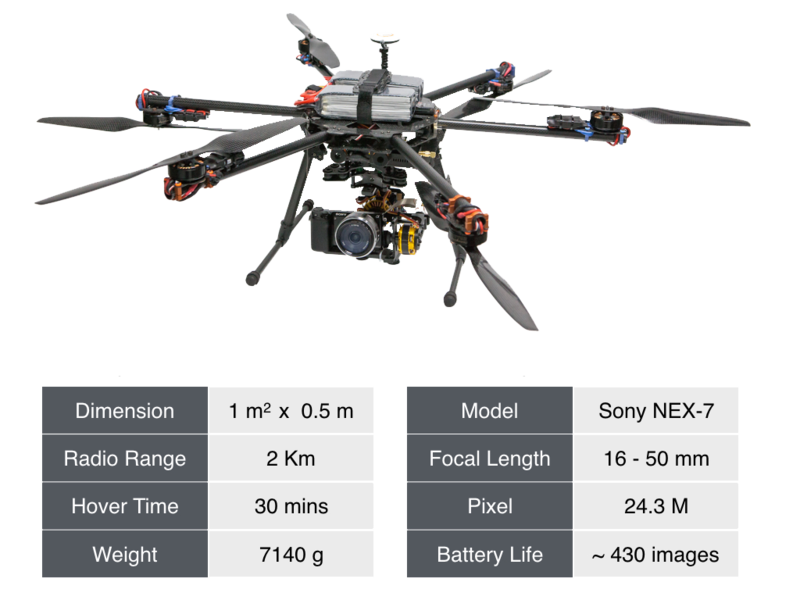 It is able to provide realtime composition of live unmanned aerial vehicle (UAV) image and 3D scenes. UAVAR utilized UAV, AR technology, remote sensing, image encoding and transmission, and image rendering methods to achieve a realtime AR experience for not just UAV operator but multiple viewers. UAVAR is an AR system including hardware and software focusing on applying UAV in construction scenarios. Augmented reality (AR), the technologies integrating the real images and virtual rendering scene, will also be integrated to enhance the application of UAV. The high viewpoint and the combination of real and virtual scene provide engineers augmented views to the construction site. They will increase the possibility of discovering the unfound problems. 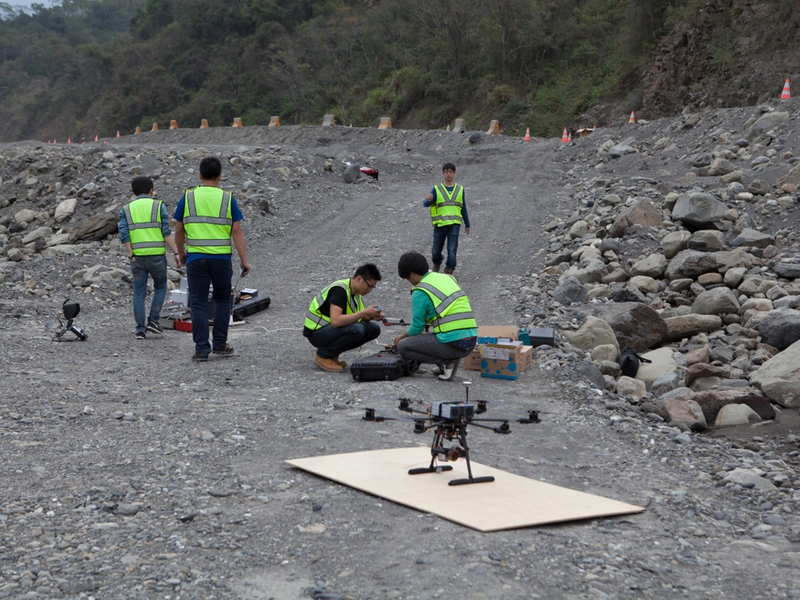 We have designed and prototyped an UAV with features important for the construction management: (1) stabilized image capturer, (2) site level image transmission and (3) telecommunication and viewing interface. 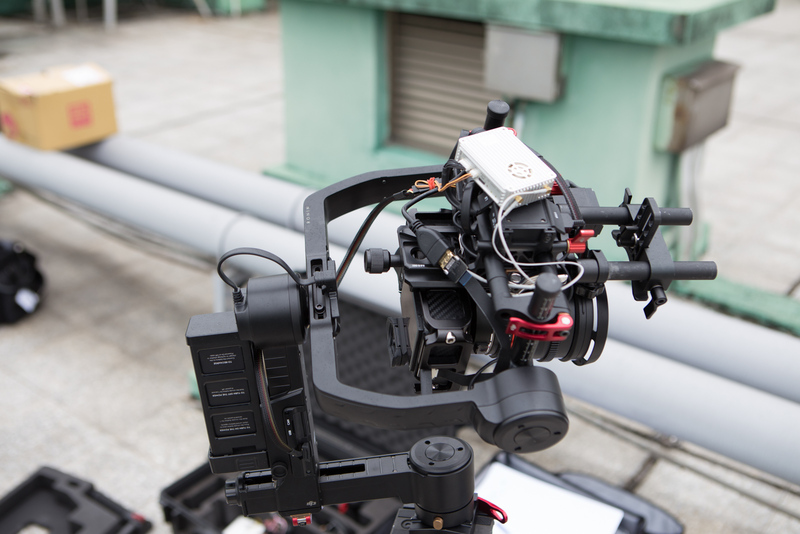 The stabilized image capturer includes a 3-axis brushless motor gimbal which can continuous adjust the camera to aim a specific direction. The image transmission was carried out by using radio frequency transmitters which specifically optimized by considering the size of the construction site. 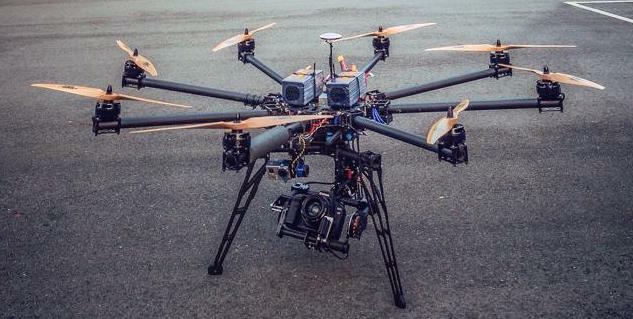 The interface includes a multi-rotor UAV that has reliable telemetry control, a display that can render the mixed scene between virtual and real views using AR technology, and a wireless local area network (WLAN) system that provides access to realtime image stream for multiple devices. From usability tests, we found the system has the potential for discovering unnoticed detail problems in real construction site, such as vehicle path planning conflicts and structure spatial dilemmas. In the near future, we plan to test the UAV-AR solution in three common construction scenarios: typical building site, bridge inspection, and urban planning. UAVAR was published and presented on 2014 ICCBE (International Conference on Computing in Civil and Building Engineering) under the topic of The Application of Augmented Reality and Unmanned Aerial Vehicle for Construction Management. Below is the presentation video going through the entire research context. - M. C. Wen and S. C. Kang (2014, Jun). The Application of Augmented Reality and Unmanned Aerial Vehicle for Construction Management. Proceedings of the 15th International Conference on Computing in Civil and Building Engineering (ICCCBE), Florida, USA. - P. Liu, A. Y. Chen, Y. N. Huang, J. Y. Han, J. S. Lai, S. C. Kang, T. H. Wu, M. C. Wen and M. H. Tsai (2014, Jun). A Review of Rotorcraft Unmanned Aerial Vehicle (UAV) Developments and Applications in Civil Engineering. Smart Structures and Systems, 13(6), 1065-1094.
fastBuild: DTM can now be built in a day. 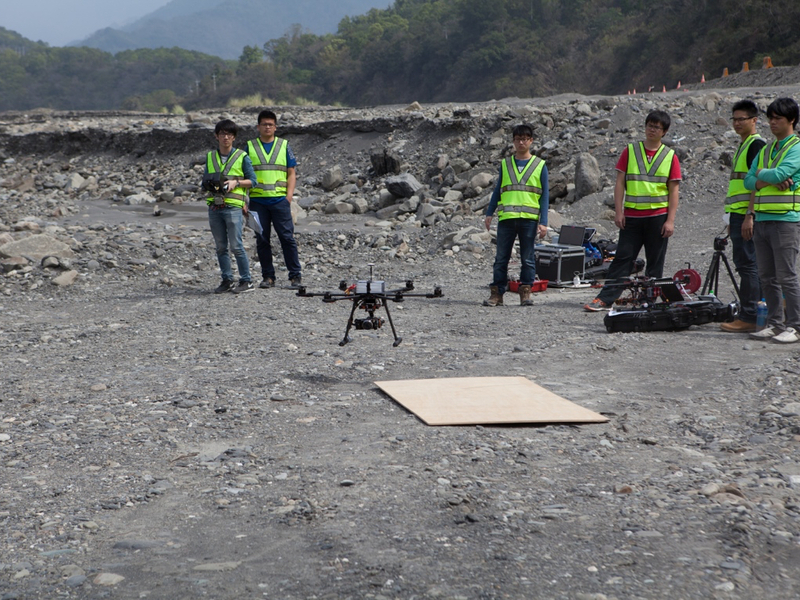 Keywords: UAV, DTM, Teleoperation, Remote Sensing, Photogrammetry, Survey, Robotics, Construction Management. fastBuild is an optimized workflow for DTM including providing hardware and software. It includes the development of the fine-tuned unmanned aerial vehicle (UAV) and the workflow of onsite operation and data processing, and post DTM processing. fastBuild method brings the time-consuming (weeks) and labor-labor-intensive (10+ crew) DTM construction into a one day workflow with 2-3 workers. Therefore, it allows DTM to be applied to more engineering situation which has been limited by resources. 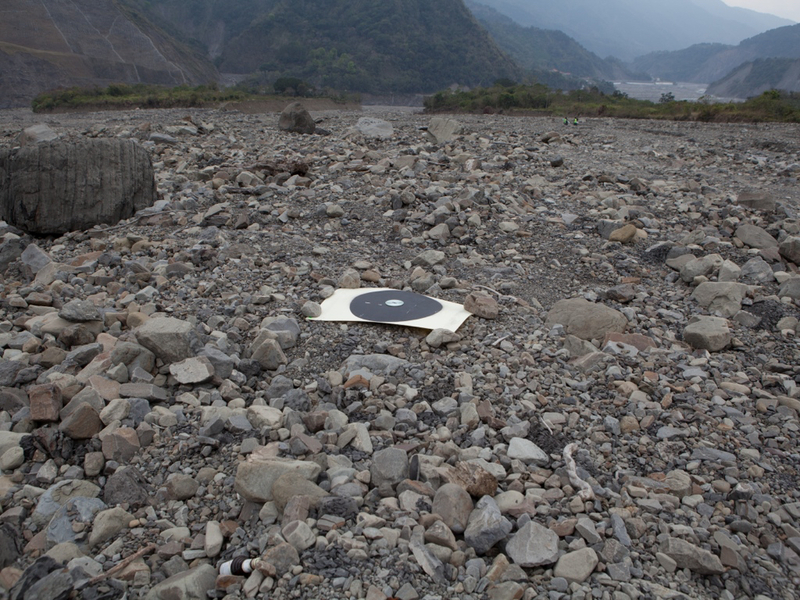 Field location: A debris fan located in the intersection of Pun-tun-pu-nas tributary and Laonong River in Kaohsiung, Taiwan. fastBuild presents a strategy for digital terrain model (DTM) reconstruction using unmanned aerial vehicle (UAV), survey, and image-based modeling technologies. Building a terrain model has been considered a critical issue since it can be used to study terrain transition, flooding simulation, field survey, etc. Existing method uses position data collected by LIDAR (Light Detection and Ranging) to build DTM. However collecting position data by LIDAR is an expensive and time-consuming approach because the surveyor needs to enter the target area with lots of costly instruments no matter how precipitous it is. Thus, we proposed a strategy of using UAV vision and total station survey data to generate imaged-based model since UAV has advantages on flexibility and cost comparing to LIDAR. 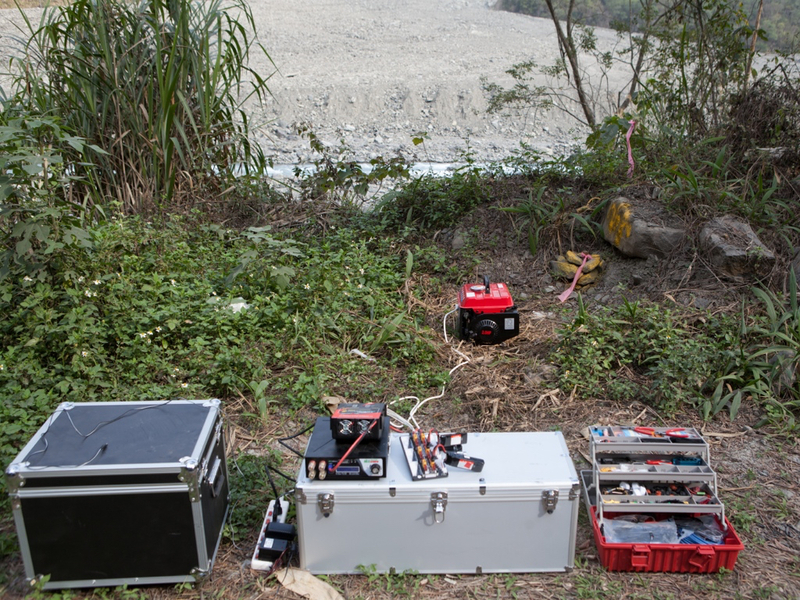 We have done a field test on a debris fan, which locates in the intersection of Laonong river and Pu-tun-pu-nas tributary, Kaohsiung, Taiwan. 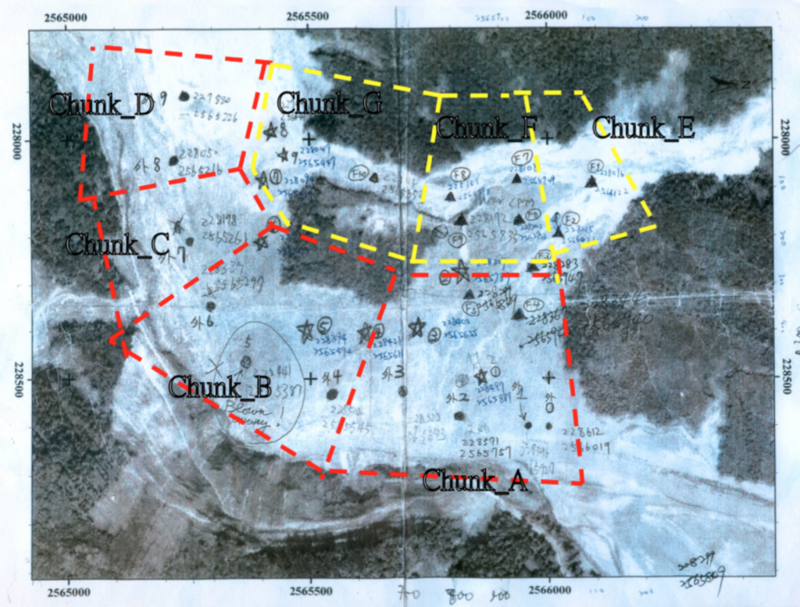 We divided the debris into several parts and put 6 to 8 marks as ground control points (GCP). 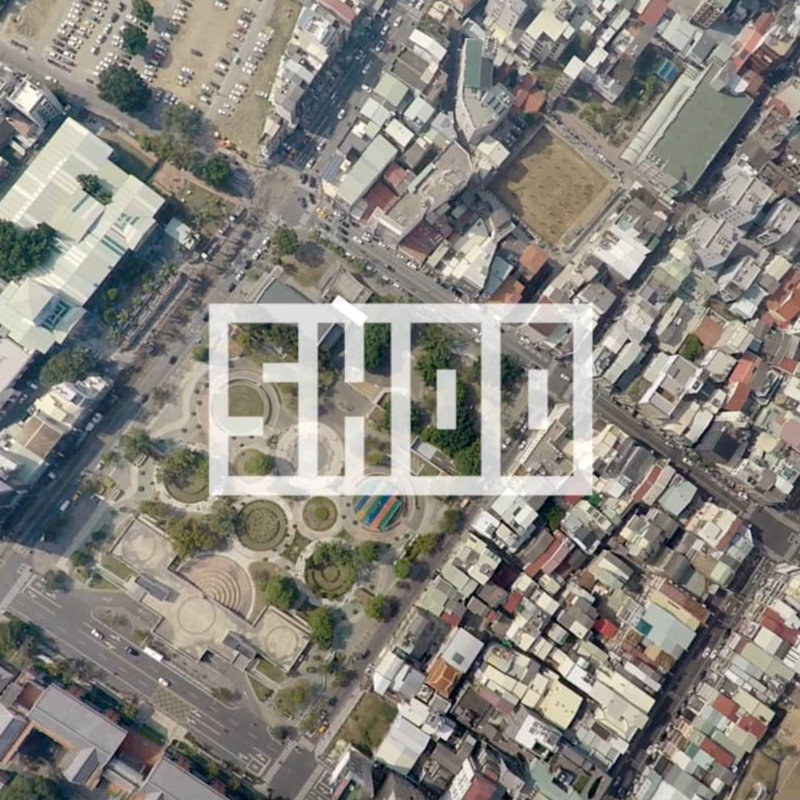 Second, we used UAV equipped with digital camera to photograph each chunk from 300 meters height. At last, we do the post-processing of image-based modeling using PhotoScan, a software that can analyze the aligned photos and build the DTM. It aligns the aerial photos, produces point clouds and exports the DTM. We compared the result with the one from LIDAR, our strategy is relatively a low-cost and time-saving way to build the DTM. We also improve the precision from 1m to 0.1m. Results of this study suggest a more efficient and applicable approach for DTM reconstruction. fastBuild was first published and presented on 2014 CONVR (International Conference on Construction Applications of Virtual Reality) under the topic of An Optimized Integration of UAVs, Surveys, and Image-based Modelling Strategies for Digital Terrain Model Reconstruction. - M. C. Wen, C. H. Yang, E. X. Sung, T. H. Wu and S. C. Kang (2014, Nov). 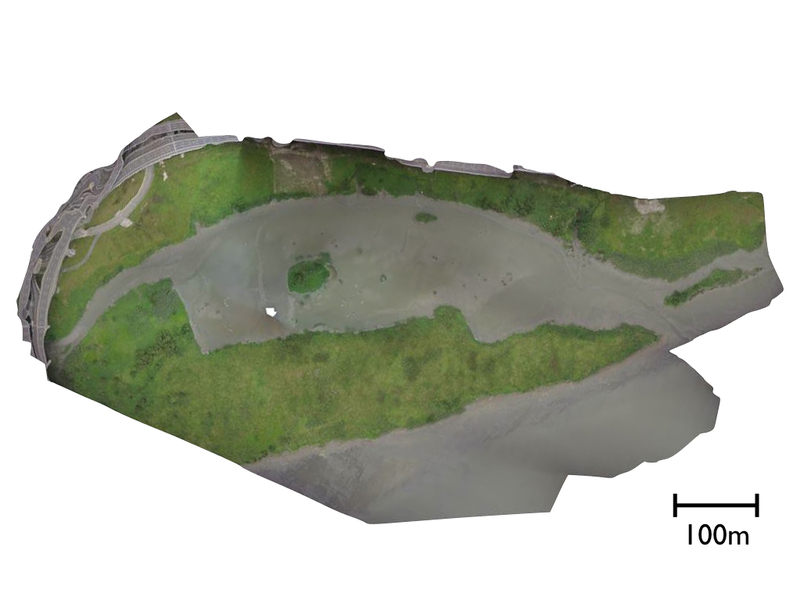 An Optimized Integration of UAVs, Surveys, and Image-based Modeling Strategies for Digital Terrain Model Reconstruction. Proceedings of 14th International Conference on Construction Applications of Virtual Reality (CONVR) in Construction and Islamic Architecture, Sharjah, UAE. Flood Game: Learn by playing! Keywords: Game-based Learning, Interactive Game, Flood Defense, Education. - M. H. Tsai, M. C. Wen, Y. L. Chang and S. C. Kang (2015, Nov). Game-Based Education for Disaster Prevention. AI & Society, 30(4), 463-475. - M. C. Wen, M. H. Tsai, S. C. Kang and Y. L. Chang (2013, Oct). Experience disaster mitigation methodology through game playing. Proceeding of the 9th APRU Research Symposium on Multi-Hazards around the Pacific Rim, Taipei, Taiwan. - M. C. Wen, M. H. Tsai, S. C. Kang and Y. L. Chang (2013, Oct). Flood Game: An Alternative Approach for Disaster Education. Proceedings of 13th International Conference on Construction Applications of Virtual Reality (CONVR), London, UK. 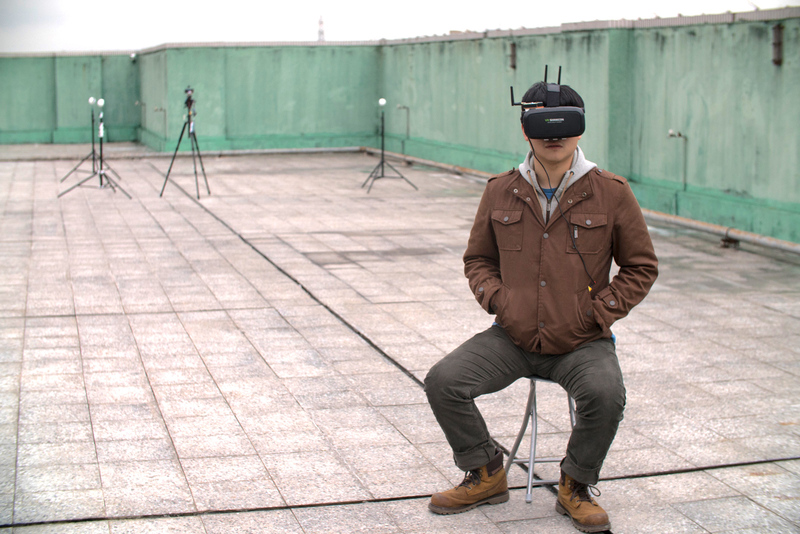 Keywords: VR, UAV, Photo Stitch, Web-based, Stereoscopic. 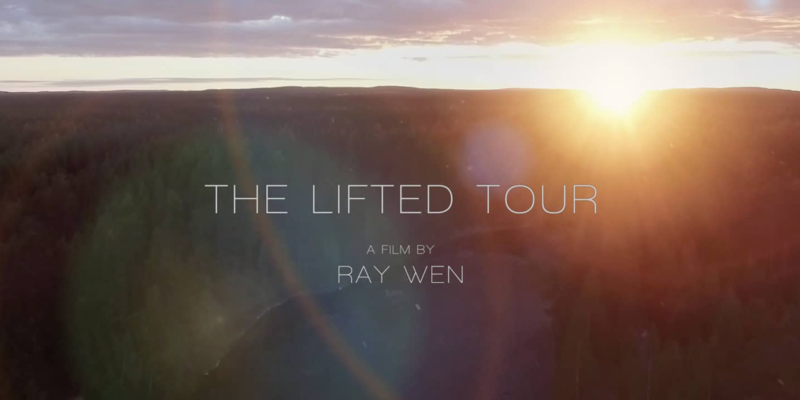 highVR provides a VR tour experience but with high altitude perspective. It is optimized for html5 which can be played on most of modern web browsers. No software or app is needed. Android and iOS devices are also supported. Demo - Hualien County, Taiwan. Ranal: Risk analysis tool for nuclear power plant. Keywords: Risk Analysis, Nuclear Power Plant, Data Visualization, Decision making. Risk percentages is visualized as colored blocks. 3DMT: Image-based 3D motion tracking and composition. 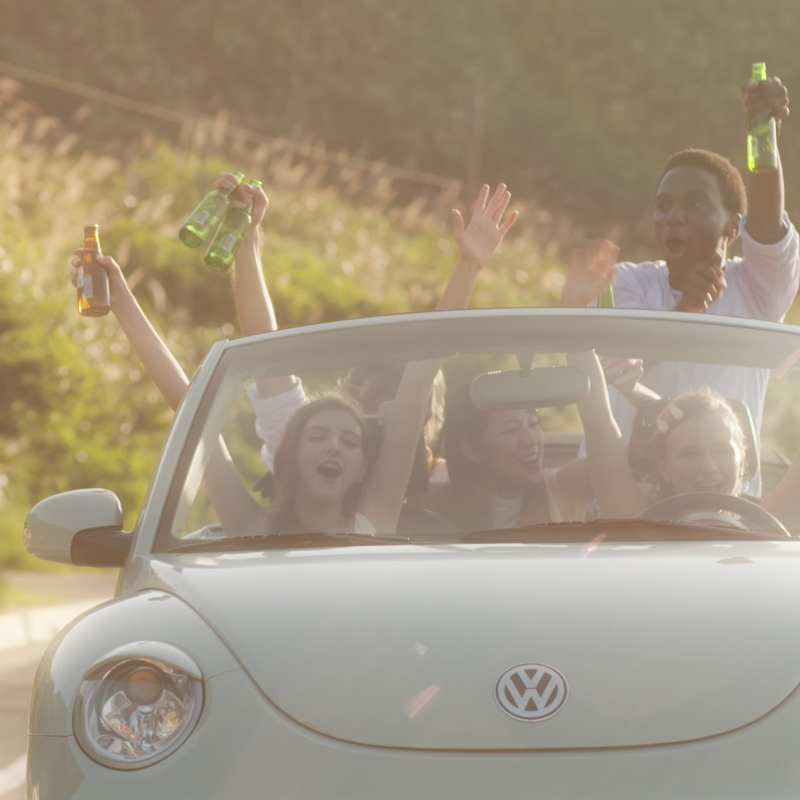 Keywords: 3D, Image Processing, Cinematography, Motion Tracking, Production. 3DMT is developed as a standard operating procedures that adds virtual object into captured footage and composited seamlessly. 3DMT determines the requirements of outputting (realistic) compositions including keying scene setup, lighting condition, character movements, camera configuration and operation, post processing of footage (tracking, grading, etc. ), and publishing. The outcome of following 3DMT procedure is promising. Thank you for viewing my portfolio. Please feel free to contact me if you are interesting in more details of my works. All rights reserved but you don't need my permission to download/print any of the media on this site for personal viewing. - C. H. Yang, M. C. Wen, Y. C. Chen and S. C. Kang (2015, Jun). 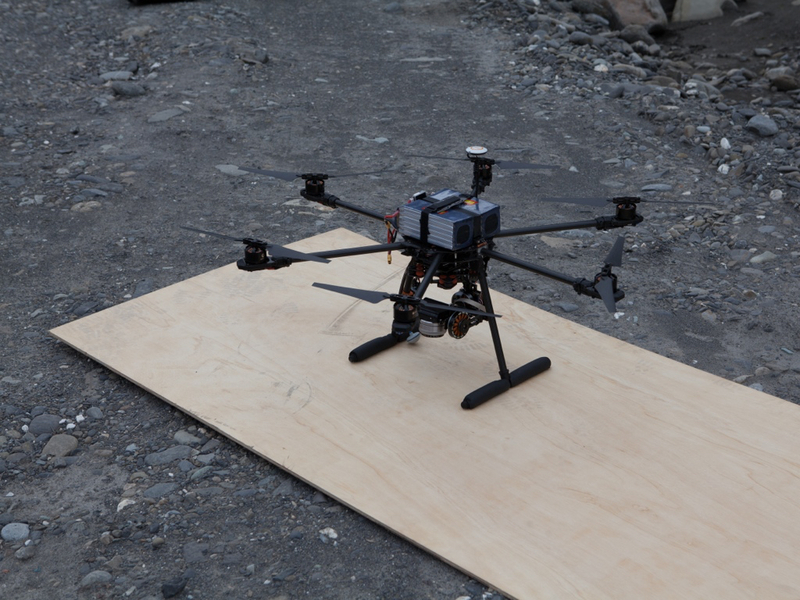 An Optimized Unmanned Aerial System for Bridge Inspection. Proceedings of 2015 International Symposium on Automation and Robotics in Construction and Mining (ISARC), Oulu, Finland. - M. C. Wen and S. C. Kang (2014, Jun). The Application of Augmented Reality and Unmanned Aerial Vehicle for Construction Management. Proceedings of the 15th International Conference on Computing in Civil and Building Engineering (ICCCBE), Florida, USA. - Y. Y. Yang, F. Lin, M. C. Wen, W. Y. Chang and S. C. Kang (2013, Oct). Development of A Portable PIV for On-site Flow Field. 9th APRU Research Symposium on Multi-Hazards around the Pacific Rim, Taipei, Taiwan. - P. Liu, A. Y. Chen, Y. N. Huang, J. Y. Han, J. S. Lai, S. C. Kang, T. H. Wu, M. C. Wen and M. H. Tsai (2014, Jun). A Review of Rotorcraft Unmanned Aerial Vehicle (UAV) Developments and Applications in Civil Engineering. Smart Structures and Systems, 13(6), 1065-1094. 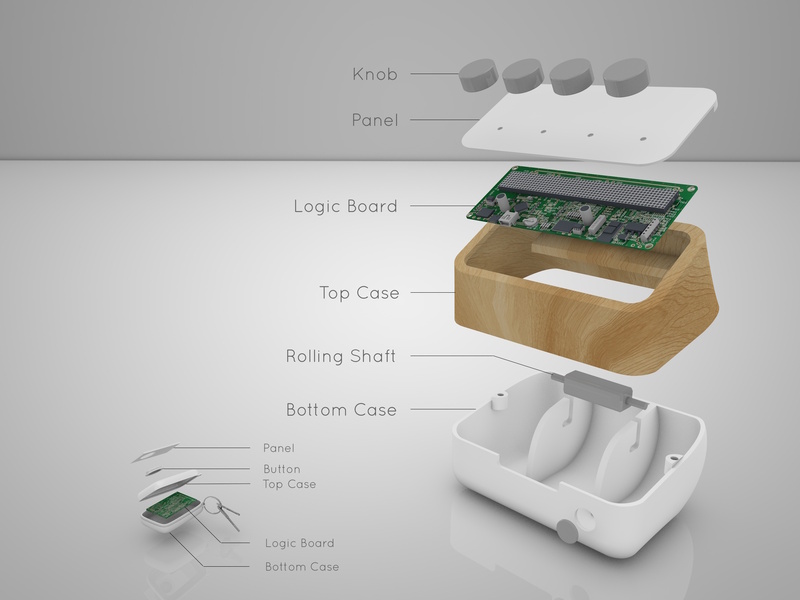 - Stanford ME310 Global Design Innovation Challenge Project, Stanford University, USA, 2014SEP-2015DEC. - Enhance the Capacity for Water Disaster Prevention and Emergency Response Operations Program, Water Resource Agency, Ministry of Economic Affairs, Taiwan, 2015MAR-2015DEC. - Simcrane3D, Ministry of Science and Technology, Taiwan, 2012AUG-2015JUL. - Smart Living, Ministry of Education, Taiwan, 2011.08-2015.01. - NTU Water Games, Ministry of Science and Technology, Taiwan, 201MAY-2014JAN. 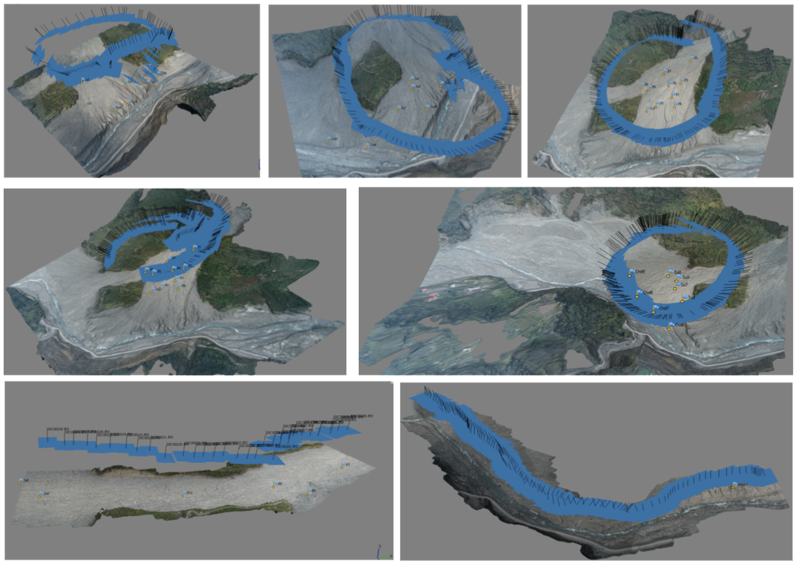 - Virtual Reality and 3D Animation of Construction Demonstration of Shimen Reservoir, Water Resource Agency, Ministry of Economic Affairs, Taiwan, 2013MAY-2013DEC. 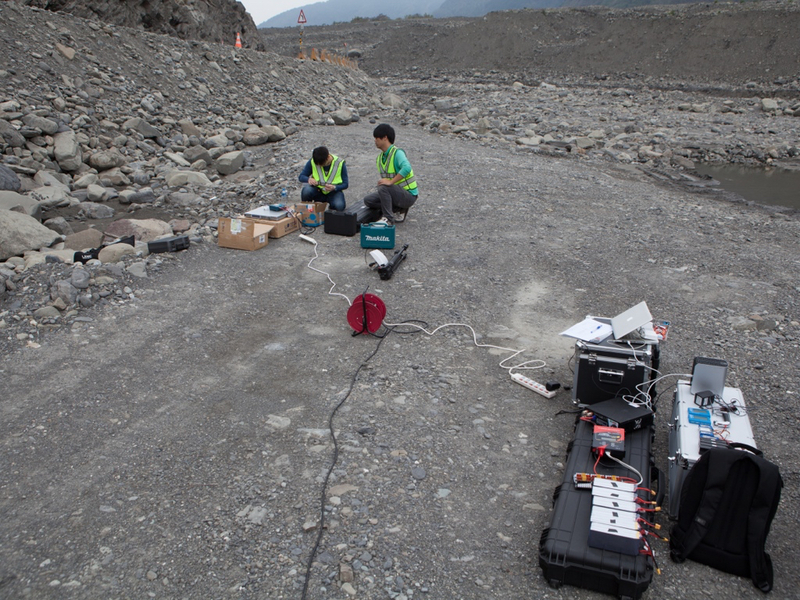 - Robot System for Bridge Diagnosis -Robot-based Bridge Inspection, Ministry of Science and Technology, Taiwan, 2011AUG-2012JUL. - Nomination of SFC (Short Film Corner) of Cannes Film Festival (Festival de Cannes), Vivian, Cinematographer, 2016. - Best Presentation of 2015 Stanford EXPE, Medi: The Full Service Pharmacy, Leader, 2015. - Research Scholarship, Ministry of Science and Technology, Taiwan, 2013-2015. - Silver Award of A-zone Film Contest, Frosted Glass, Director and Cinematographer, 2012. Copyright © 2016, All rights reserved by Ray Wen.